Built in 1949 with a purpose to empower the vast textile heritage of India, Calico Museum of Textiles is now a famous gallery of Gujarat. Calico Museum of Textiles houses beautiful textiles, dating back to 15th century. The museum was founded in 1949 by Gautam Sarabhai and his sister Gira Sarabhai at the times when Gujarat was known for its textiles. The museum was inaugurated in the year 1949 by Jawaharlal Nehru, first Prime Minister of India. Till 1983, the museum was a part of the Calico Mills. Later the museum was shifted to Sarabhai House due to an increasing number of exhibits. There are different types of galleries in the museum. In the Religious Textiles gallery, one can see an extensive collection of Vallabha Sampradaya, who was a known devotional philosophe. Also, there is a Historical Textile Gallery where one can see Mughal carpets, weapons, and hamlets. Calico Museum brings history alive in its vast collection that recalls the grandeur of the bygone eras. Textiles treasures trove in the museums has captured the attention of many prominent personalities like John Irwin, Alfred Bühler, Moti Chandra and its present Chairman, Pupul Jayakar. The finest collections included in the museum are the attires and fabrics like silk weaving, patolas, patalu shawls, scarves, and sadi. Helmets, chain mall, & shields, persian carpets used by the great Mughal emperor like Akbar, and embroidery collection like Adhai Dvipi Pata, Jnana Baji Pata, Sarada Purnima, Govardhana, Dharana, Gopastami, and Ramanavami. Inside the museum, there are textile techniques galleries and a library, which has a sizable number of books related to textile and art. Also, museum authorities keep on organizing a workshop for the students and researchers to understand the textile industry in a better manner. 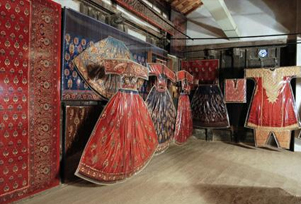 People who are interested in textile and fashion designing should make their way to the Calico Museum of Textiles. 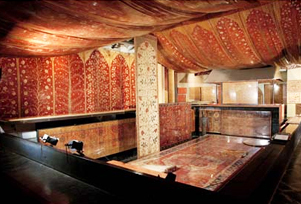 An exclusive historical collection of the museum attracts tourists on their holiday to Gujarat. Visiting Hours Details: Main textile gallery of the museum can only be visited on the morning tour (maximum 20 people), which lasts two hours. Afternoon tour is devoted to the Sarabhai Foundation's collection of religious art, which explores depictions of Indian deities, including textile galleries. For afternoon tour maximum 10 people are allowed. Attractions: Kashmiri shawls that took three years to make, double-ikat cloths made of 100,000 threads, holographs on palm leaves, kalpasutra fabric, fine fabrics such as silk weaving, patolas, patalu shawls, scarves, court textiles used by the Mughal.